Fox Nomad is the work of Anil Polat – a cool guy with a super-cool job. He combines his work as a computer security engineer with a lifelong journey to visit every country in the world! He’s made 90 of them so far, and says he’s in no rush to compete the task. Yeah, we’ll bet… His blog is packed full of tips on travel and, naturally, with his background, the tech you can utilize to travel smarter. Because, let’s face it, when it comes to deciding about that, for most of us it’s like searching for a needle in a haystack! From information on Wi-Fi passwords in airports and lounges from around the world to hotel room workouts, the information on this blog is truly eclectic – yet wonderfully written and crammed with useful information. This has got to be the winner of the best name for a blog award, don’t you think? Camels and Chocolate is superbly written (it should be, the owner, Kirstin Luna is a well respected American journalist who’s been featured in many magazines that have a global presence) – and the photos aren’t half bad too! There are a huge variety of informative articles here. The Cook Islands, Marrakech (Morocco), Montana are just some of the places she’s visited and provides in-depth information about. Sign up for this one if you need inspiration about where on our wonderful planet you need to put on your bucket list. 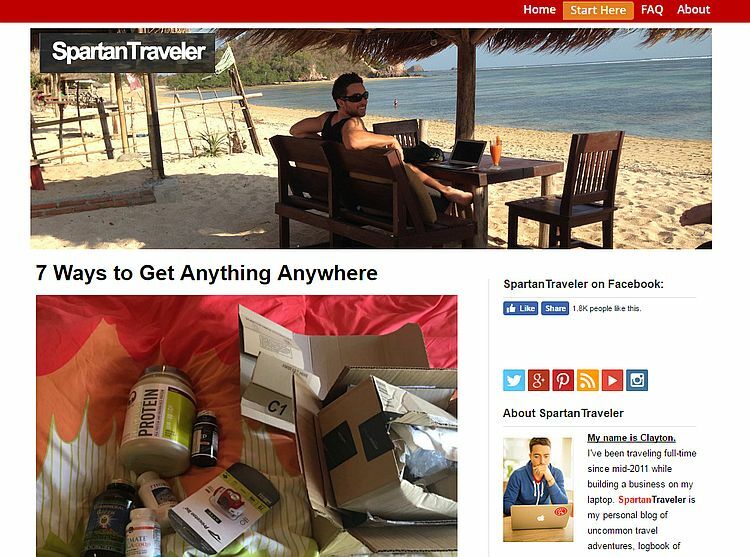 We love Spartan Traveler, the blog of Clayton B. Cornell who, in 2011, did what many of us dream of doing – namely giving up his J.O.B. and went traveling full time. Packed with gems of info about how to travel light, adventure travel, and how to minimize the costs of traveling to make it truly affordable to all, this is the blog to subscribe to if you get that traveling is all about the journey, and not necessarily the destination. In addition, if you too yearn to make your money while traveling the world, there’s a whole host of hints and tips on what you need to do to truly make such a lifestyle possible. Map Happy is less about being a blog, and more about great information on practicalities whilst traveling. For instance, how do you stay entertained now that many airlines won’t allow laptops and tablets on board? Or how, if you’re an Amazon Prime customer, that you can borrow virtually all of the Lonely Planet guidebooks – for free! It’s divided into sections to make it easier to navigate, so you don’t have to waste time scrolling through tons of articles to find the stuff that’s relevant to what you want to look at. This is the perfect blog for anyone who travels a lot, for expats, planning trips, best ways to maximize your spends in different countries, gear reviews, and what to do in an emergency. If you only read one blog on a regular basis, then for travelers, you’d be well advised to check out Map Happy. This Boston girl has so far clocked up 65 countries on her way, and her USP is the fact that she travels alone. Around the world it’s common for women to do this, but in the US, definitely not so common. She’s been featured in many a glamorous publication. Think The Boston Globe, Marie Claire, Huffington Post… So if you’ve a craving to ditch the travel companions and strike out alone, this blog will give you all the information you need to do just that. Think that couples can’t do the constant travel thing together? Then think again. Because that’s exactly what British couple, Simon Fairbairn and Erin McNeany, authors of Never Ending Voyage, have made their reality. They took the brave step of quitting their jobs and heading to Rio in 2010. And since then, haven’t looked back. These true digital nomads now make their entire income whilst traveling – and provide some awesome content about how we too can make our travels as easy, fun, and cost-effective as possible. Dangerous Business is one of the newer kids on the blog scene, written by Ohio girl, Amanda who, we have to stress, says that she isn’t a digital nomad. Well, we firmly have to disagree. Because this savvy lady certainly has a blog that rivals some of the best ones out there. But what’s unique about Dangerous Business is that she hasn’t committed to full time travel. What she does is take trips, and then return home – and holds down a regular job or undertaking study. This shows how we too can emulate her success whilst managing to travel the world rather more than most people manage. From great articles, inspirational tips, amazing photography (and she’s learned how to do that along the way), this blog will appeal to those who can’t really take the plunge and give up a ‘normal’ life to travel – but still want to make the very most out of their vacation time as possible.